This got me excited! It would be a good experience to join both the running event and the bike race. Haven't joined a bike race, maybe a good opportunity for me to try. Will invite my running buddies as well as my bike buddies to join this event, it would be fun. The thing is, i didn't have any training for the last two weeks, and im thinking if i should do it.. Nah, i guess it's all in the mind.. I just hope i get the right discipline for the next two weeks to prepare my body and mind. But hey, not too fast... First and foremost, i need to get my clearance from my doc. Hopefully i get a go signal, then i will sign up for the mizuno run on sunday. I'll take it light and hope i get a good recovery. 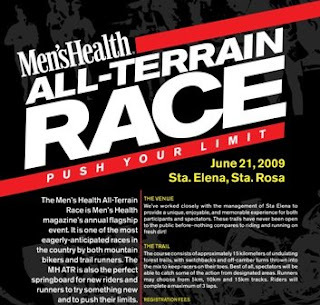 I would not expect a PR on the all terrain trail run, but will definitely know how i would do with the rest of the bikers (hehe.. i just hope im not the last to arrive at the finish line). This will be a good experience and a chance to learn from it. I just hope that they open the trail for practice before the race so that I can get a feel of the trail. Anyways, obviously im very excited to go back to my training. These sport (running and biking) is addictive. It keeps you fit and healthy (oh, but i did get sick, huh?, hehe..) Would you believe that i lost 7 lbs in 6 weeks, just by including running in my regimen? Yes, i did lost 7 lbs.. I remember reading "RodRunner's" blog, saying "You want to lose weight?" "TAKBO TAYO!"